Mit der Banneraktion soll im öffentlichen Raum Aufmerksamkeit auf die Käfige dieser Gesellschaft und die Menschen darin gerichtet werden. 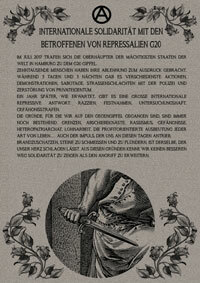 Repression und Knast werden insbesondere gegen Menschen aufgrund von Hautfarbe, Nationalität, Il_legalisierung, Vermögen sowie politischer Ausrichtung verwendet. Knast bedient dabei ein gesellschaftliches Bedürfnis nach Projektionen und Distanzierungen von unerwünschten Menschen und Verhalten und dessen Bestrafung. Sicherheit kann jedoch nicht durch Bestrafung und Ausgrenzung erreicht werden – vielmehr festigt der Staat mit der Kriminalisierung bestimmter Handlungen sein Gewaltmonopol, wodurch gesellschaftliche Hierarchien und Ungerechtigkeiten reproduziert werden. Das Knastsystem ist also unfähig, Gerechtigkeit herzustellen, sondern tut das Gegenteil. Wir wollen diesen Tag nicht „nur“ sogenannten Politischen Gefangenen widmen, sondern allen Menschen, die Repression und Knast erleben. Knast demütigt und individualisiert und soll die Betroffenen aus ihren Zusammenhängen reißen und entpolitisieren. Jede Repression ist politisch und dies zu erkennen ein wichtiger Schritt zu einer umfassenden Kritik an Strafe und Staat. Wir streben nach einer Welt, die keine Knäste und Käfige braucht! Wir freuen uns sehr, dass Anarchist*in Eule seit dem 15. März nach U-Haft, Disziplinarmaßnahmen und einem politischen Schauprozess (taz.de/Archiv-Suche/!5574470&s=eule/) wieder in Freiheit ist! Viele Andere bleiben jedoch hinter Gittern, Willkür und gesellschaftlicher Stigmatisierung ausgesetzt. Schreibt ihnen Briefe, brecht die Isolation! 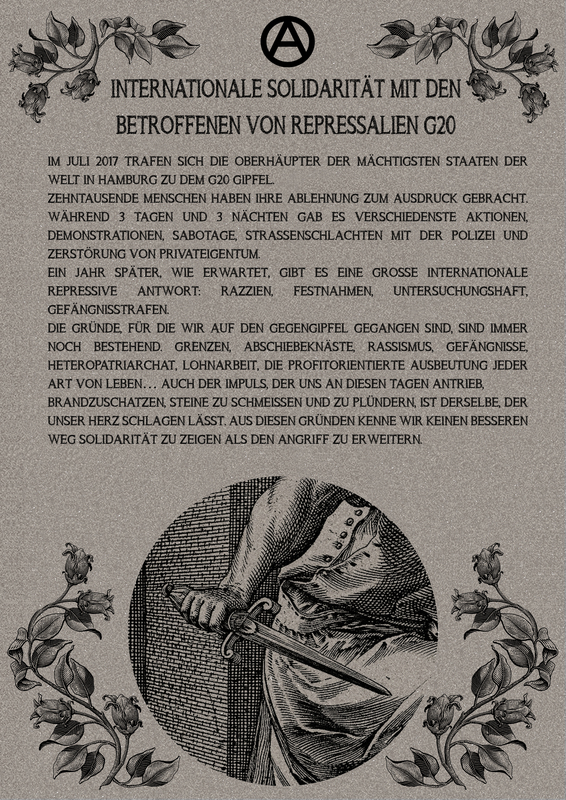 Macht Euch über Repression schlau und schützt Euch und Eure Zusammenhänge! Gegen den Staat und seine Repressionsorgane – Solidarität ist unsere Waffe! Feuer und Flamme allen Knästen und den gesellschaftlichen Verhältnissen, die sie hervorbringen! 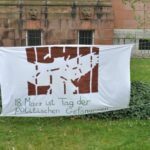 On the ocassion of the International Day of Political Prisoners today, the 18th of March 2019, two banners were dropped in Freiburg in solidarity with all people enduring prison and repression. Some meters high between two trees in Stuehlinger Park the words “For a world without cages” can be seen as of the early hours of this morning. Another banner was hung up opposite the university library concerning the 6-month-long imprisonment of the recently freed anarchist Eule from Hambach Forest. The aim of the banner action was to bring public attention to cages and the people who are forced to live in them. Repression and prison are especially used against people based on skin colour, nationality, il_legalisation, wealth and political leanings. Prison thereby serves a societal function of projecting and distancing of unwanted people and behaviours and punishing them. 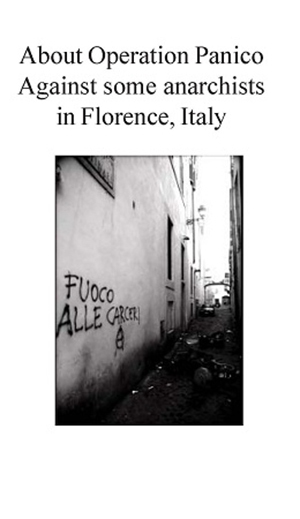 However, security is not achieved through punishment and exclusion – rather, the state strengthens its monopoly of violence by criminalizing certain actions, thereby reproducing social hierarchies and injustices. The prison system is thus incapable of producing justice, but achieves the opposite. We do not want to dedicate this day “only” to so-called political prisoners, but to all people who experience repression and prison. Prison humiliates and individualizes, and is supposed to tear those affected out of their contexts and depoliticize them. All repression is political and to recognize this is an important step towards a comprehensive criticism of punishment and the state. We strive for a world in which no jails are needed! 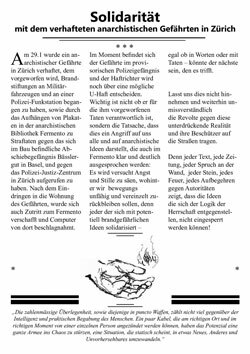 We are glad that the anarchist Eule has been free since March 15th, after pre-trail jail, disciplinary measures and a political show trial (taz.de/Archiv-Suche/!5574470&s=eule/)! However, many others remain behind bars, subject to arbitrary treatment and social stigmatisation. Write them letters, break the isolation! 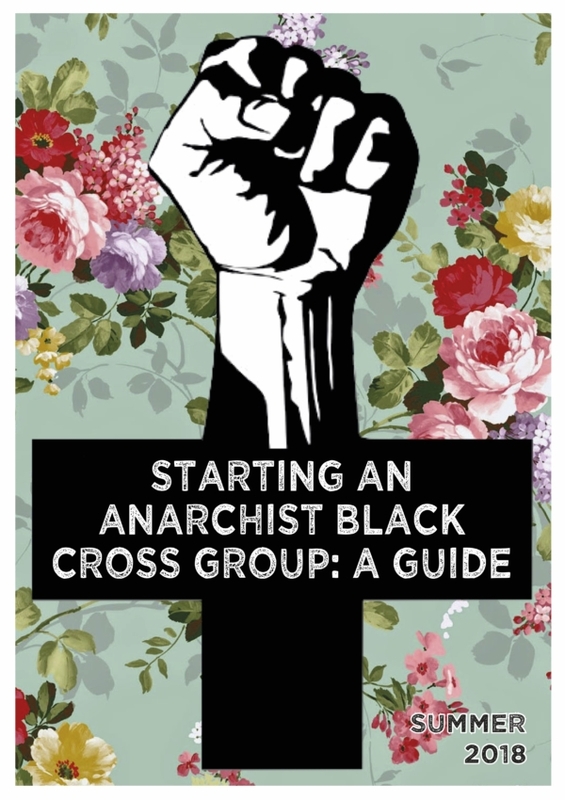 Inform yourselves about repression and protect yourself and those around you! 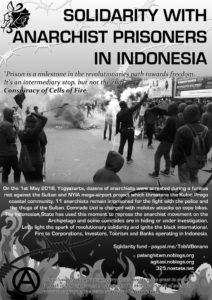 Against the state and its instruments of repression – solidarity is our weapon! 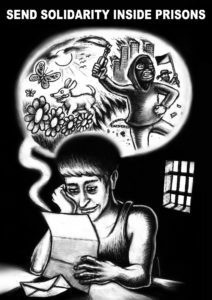 Fire to the prisons and the system that creates them! This entry was posted on Friday, March 22nd, 2019 at 15:15	and is filed under Gefangene, News, Solidarität.